• Kyle Gibson had a rough pro debut at high Single-A, but since then the 2009 first-round pick has thrown 33 innings with a 1.36 ERA and 25-to-7 strikeout-to-walk ratio, including a one-hit shutout in which Gibson allowed just one infield single and one walk, immediately erasing both runners with a pickoff and a double play. Gibson faced the minimum of 27 batters on just 91 pitches while finishing with six strikeouts and 16 ground-ball outs. He fell to the Twins with the 22nd pick last June because of a short-term injury and high bonus demands, but Gibson was widely considered a top-10 talent and he's certainly showing why after skipping rookie-ball and low Single-A, with a 1.96 ERA, .214 opponents' batting average, and 32-to-9 strikeout-to-walk ratio in 36.2 innings. Better yet, he's induced four grounders for each fly ball and his ground-ball rate of 67 percent would've led MLB by a wide margin in 2009. UPDATE: Gibson has been promoted to Double-A. I like him. I think he could go out there in the big leagues and get some hits. Can he play defensively? No. He's got some things to learn. He can run and can outrun some of his mistakes. There's a lot to learn but he's not that far out. Everyone is not blessed with the greatest arm strength. You have to learn how to get rid of the ball quicker. Revere ... still has a ways to go to become a plus defender in the outfield. Revere's arm strength is below-average at best, but his speed alone should translate to better outfield play than he showed this spring. One scout who watched Revere for a week liked Revere's speed and short, quick stroke, but came away disappointed with his outfield instincts and reads off the bat. None of which is to suggest that Revere isn't a good player, as he ranked No. 5 on my annual list of the Twins' prospects. However, a huge part of his long-term value depends on defense and for now at least the assumption that he'll have a great glove simply because he has great speed is an iffy one. Offensively, he's batting .287/.367/.319 with three extra-base hits, nine steals, and a 16-to-10 strikeout-to-walk ratio in 25 games at Double-A as a 22-year-old. • Aaron Hicks is somewhat surprisingly repeating low Single-A after the 2008 first-round pick hit a relatively disappointing .251/.353/.382 in 67 games at Beloit last season. He got off to a brutal 1-for-30 start, but is 29-for-69 (.420) with nine extra-base hits, 16 walks, and five steals since to raise his overall line to .303/.425/.455. Much of his game is still a work in progress, but drawing 89 walks in 622 career plate appearances is great to see from a toolsy 20-year-old. 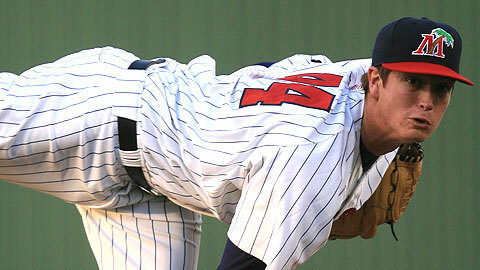 • Hicks' dramatic early season turnaround actually qualifies as merely the second-largest by a prominent Twins prospect. After imploding last year with 58 walks, 15 wild pitches, and seven hit batters in 33 innings Shooter Hunt began this season heading down the same dangerous path, walking three and allowing five runs without recording an out in his debut at Fort Myers. However, since then he has a 2.20 ERA and 23-to-5 strikeout-to-walk ratio in 16.1 innings. • Many fans wanted Danny Valencia on the Opening Day roster, but he's hit .275/.318/.363 in 26 games at Triple-A and now has a .283/.309/.429 line with a 55-to-15 strikeout-to-walk ratio in 97 total games at Rochester. He's also four months from his 26th birthday and gets worse reviews for his defense than Revere, so Valencia's window of opportunity could be closing. I'll be surprised if he spends major time in Minnesota this year unless an infielder has a big injury. • Anthony Slama keeps dominating at Triple-A and keeps being bypassed for call-ups because the front office doesn't believe he's for real and refuses to place him on the 40-man roster. He has a 1.77 ERA, .121 opponents' batting average, and 25 strikeouts in 20 innings at Rochester while the rest of the Triple-A staff has a 5.66 ERA. Slama is 26 years old with a 1.85 ERA and 296 strikeouts in 204 pro innings, yet the Twins won't even give him a look as a middle man. • For whatever it's worth after one month, some other prominent Twins prospects off to good starts: Rene Tosoni, David Bromberg, Angel Morales, Deolis Guerra, Trevor Plouffe, Robert Delaney, Tom Stuifbergen, Dustin Martin, Daniel Osterbrock, Liam Hendriks. And some off to poor starts: Chris Parmelee, Joe Benson, Carlos Gutierrez, Danny Rams, Josmil Pinto, Reggie Williams, Juan Portes, Steve Singleton, Deibinson Romero, Estarlin De Los Santos. • He no longer qualifies as a prospect and his performance at Triple-A goes well beyond a poor start, but Glen Perkins is 0-3 with a 10.90 ERA and .388 opponents' batting average through five outings. Unless he just forgot how to pitch at age 27 and with a 4.73 ERA in 281.2 innings as a major leaguer, it seems fairly likely that Perkins is still hurt. Either way, he's gone from the doghouse to the outhouse and the Twins' odds of finding a decent trade for Perkins look slim. Is slama’s situation a money/control thing the twins are doing? You had joe benson in the bad start category and with a line of .195/.324/.379/.703 thats probably the correct distinction. But he has shown good discipline and power and I would guess hes been unlucky to produce such a low BA, although he does K too much. The slama situation is because he has mediocre to bad control at the milb level and features a mid 80’s fastball. There are plenty of reasons to be skeptical about whether slama will be good at the mlb level. I think he deserves a shot which hell eventually get but I doubt hell live up to his milb numbers. Im also not sure which promotion gleeman is upset he was passed over for. The burnett one i guess. I personally believe burnett is the better relief prospect. Other than that i cant think of a bullpen spot except for mahays thats been filled. Hell probably be passed over when they send ramos down but i dont recall him being passed over for clearly inferior relievers. Anybody hear what happend to Hicks on Saturday? He was pulled halfway through the game and didn’t play on Sunday. Haven’t seen anything reported about what happened so I figure it’s not serious. I’m more curious than anything. I just checked out our Minor system’s teams from the strib. Our AAA team – STINKS – They gave up 32 runs in 2 games!!!!! Our AA team – STINKS – They can’t hit. that shows the future for our club could be dark. All they are doing is learning to lose games. What happened to all of our talent? I thought the twins were good and had depth in the minors but I don’t think its there. – Shut down our minor league system, they gave up runs in games!!!! Aw…it was fun badgering you about Hicks on Twitter! This Slama situation is incredibly frustrating. What does the guy have to do to get a chance? I like Alex Burnett, but Slama seems better prepared for the role than Burnett. Can we at least see if Slama can get big league hitters out? There’s nothing about his track record to suggest he can’t. He has to be a better option than Crain. “You had joe benson in the bad start category and with a line of .195/.324/.379/.703 thats probably the correct distinction. But he has shown good discipline and power and I would guess hes been unlucky to produce such a low BA, although he does K too much. Not to mention Slama has generally been much older than his competition. They need to do this, really, they do. You listed every conceivable stat for Slama except walks. Simple oversight or doesn’t support your case? I’m glad to see that Blackburn has figured out that he has no chance unless his sinker ball is actually sinking. Maybe that contract extension wasn’t a mistake after all? Oh so the problem was that he forgot he was a sinkerball pitcher? Where have all the great baseball minds gone? It is so confusing listening to Blackburn talk about his game and also hearing others talk about it. They say if he over throws the ball has no sink and opponents crush it easily. If he just throws it normal with its sink then it is all grounders and he generally does well. Can we get an explanation of why he would over throw stuff? By the same logic can we expect to hear Thome come out and say he does best when he doesn’t hit ground balls? How he needs to focus on just crushing everything to the outfield or beyond. The explanation is, it’s all in his head. If you read Blackburn’s post-game interview, he has to remind himself not to throw it too hard. This seems contradictory to me. If they don’t think he’s worth anything, they don’t care about burning his options or having to send him through waivers, so there’s no reason not to put him on the 40-man roster. It seems more likely to me that they are worried about that sort of thing, and so he’ll get his chance in mid-August when they won’t have to burn an option to see what he can do. The Twins can’t really afford to be uncareful with young right-handed relievers right now, as Rauch, Guerrier, and Crain will all be free agents at the end of the year and they’re unlikely to be able to resign more than one of them. Maybe none if Liriano keeps pitching well and Delmon continues to flirt with average. Nick Blackburn doesnt rely on a sinker for success he relies on being very lucky. For his career he gets GBs at a very average 45% rate on BIP. Even yesterday he got 11 AO and 10 GO. But reading the post game crap youd think he was brandon webb in his prime. Also hes got scary peripherals this year (i know its only 6 starts). His control is the worst its ever been with 2.5 bb/9 which is .7 more than hes walked in the past. Hes striking out 2.0 k/9 which is unbelievable and less than half his already terrible career mark of 4.22 k/9. He has the lowest stikeout rate of any starter in baseball and strikes out a full guy per 9 less than the next closest competitor, who happens to be livan hernandez. His FIP and XFIP are 5.91 and 5.2 respectively, and I havent checked his SIERA but im sure it paints and even worse picture. Hes always been very lucky stranding a much higher percentage of players than his strikeout totals would indicate he should and getting way more double plays turned than his gb% indicates he should. But this year hes actually getting worse. No one can have long term success striking out 2 per 9. Move Revere to second base. His skills would be much more valuable there, since the Twins have a plethora of outfield depth and no one at second base in the future. I think that a triple slash of .310/.360/.375 is a reasonable expectation for Revere, and that line is much more valuable playing average defense at second than playing below average defense in left. I think the Twins DO KNOW Anthony Slama’s value and his upside. They may not see him as a future closer or even 8th inning guy, but they do now he’s solid Aaron G!! And if that doesn’t work, they could always groom Ramos for a middle-infield position. Aaron, Shooter Hunt’s turnaround is worth more emphatic straight up pimpage than you’re giving, especially after tonights “let me just strike out these last 6 hitters in a row” action. He needs to be back in the rotation as soon as his mind can be finessed, eased, jammed or bamboozled into holding together when he’s asked to throw the first pitch of the game from the windup. I’ve been on the Slama bandwagon for a long time — since the beginning of that INSANE 2 month run of 50% K rate in Ft. Myers in 2008 — and think you’re basically correct. I just don’t believe the pitcher exists who strikes out 1 in 3 AAA hitters (and has done as well or better at every level before that) but cannot strike out MLB hitters at a superior rate, 87 MPH fastball or no. There’s no Pitch F/X for MiLB, but if there were I’m guessing the dudes got crazy REAL movement, even if it’s not something the scouts can pick up on. Are the walks potentially problematic? Of course, but even with a high-for-the-environment-hence-likely-to-come-down HR/FB rate his FIP is still 3.65, so they’re not killing him. He’s GOTTA be worth a look at some point, but for now I have no problem keeping him there for a month or two and seeing if he continues to improve… unless that means Jose Mijares in his current state, which we’ve just learned it does, so scratch that and FREE ANTOHNY SLAMA. Probably all the more reason to at least see if Slama can get MLB caliber hitters out. They need to at least give him some big league innings this fall with the expanded roster to see if he could replace Rauch, Guerrier or Jesse “Lefties have a .948 OPS against me” Crain. but that would require the Twins to ya know – put Slama on the 40 man roster and all. Delmon flirting with “average”. Good line dude. Delmon has always reminded me of the sandwich you get in a vending machine that comes packed in that big plastic white triangle. It’s room temperature and just not fun at all to eat. If there is absolutely no alternative – then I guess let’s go with it and hope for no digestive repercussions. Slama’s best argument is what the Oakland A’s guy did Sunday vs the Rays. I don’t think he threw one pitch over 90mph and only needed 107 total pitches to get 27 outs. The “Blackburn is incredibly lucky” angle should be dropped. I’ve seen it half a dozen times at various sites over the years. His periphreal numbers do not line up with his main ERA and W/L. That is true. It is kind of bizarre I must admit. But the dude has logged 78 starts at the major league level with career 25/25 record and 4.20 ERA. 78 starts are just too many to claim that the laws of averages are still vastly unbalanced. Guy is the definition of average. He might get better over the next couple of years and have a winning record and/or sub-4 ERA. As his velocity dips with age he will become a back end starter or long reliever. Jake whats your definition of average? Pitching in MLB is very difficult. 200 IP and 25 wins in a little over 2 seasons ain’t too shabby. The Nick blackburn is very lucky. This is certainly more true than nick blackburn is a sinkerball pitcher, which the stats dont support, or nick blackburn is a clutch pitcher which is perspectiveless hokum. And 2 seasons is definitely not a large enough sample size to make absolute judgments about a player. Look at carlos silva, who is a similar low strike out, low walk, groundball neutral pitcher. He posted eras of 4.21 and 3.44 in his first 2 years with the twins. The wheels fell of the next year and hes been getting paid since because GMs werent smart enough to look beyond era and win totals to see that he brought very little to the table as far as pitcher controllable skills are concerned. Blackburn gets more double plays than he should and strands more baserunners than he should, these things are what make him lucky. He doesnt have the skill of inducing way higher than average double play balls, hes been lucky enough to have a lot of ground balls hit at people with men on base. Its like risp. 2 years ago the twins hit 312 with risp for an entire season. That was lucky even though they did it for an extended period of time. And next season with largely the same group of players they hit 260 with risp. Lucky is lucky. And blackburn is already the twins 5th starter. Hes easily got the least ability on the staff and hes the guy i want on the mound the least. He might pitch a good game if the opposing teams cracks some linedrive right at guys and hit into 4 dps. Maybe he can keep the team off the board with his bloated whip and inability to strike anyone out, but in the long term he does almost nothing that successful pitchers do well. Valencia has been much better the last two weeks. He carries a 15-game hitting streak into tonight’s game. And I don’t know who you talked to about his defense, but I have heard good reports from the major league field staff after his work in spring training. It will be interesting to see how he’s doing at the all-star break. But I wouldn’t write him off at this point.